What kind of people are treated? Special needs dentistry is intended for people who cannot receive dental treatment in the conventional manner or safely at nearby dental clinics for some reason. Individuals for whom visiting a nearby dental clinic is challenging because they may disturb others by making noises or becoming agitated in the waiting room or treatment room. People who cannot complain of tooth pain because of intellectual disability or autism, or those who cannot receive treatment in proper and cooperative ways because they do not understand the need for treatment. People who have difficulty in taking a proper position to receive treatment because of physical disabilities or tension. People who cannot receive treatment safely because of other diseases such as epilepsy, hypertension and diabetes mellitus, or medications they are taking. People who cannot receive dental treatment because they choke or vomit (or feel queasy) when dental instruments are put into the mouth, or because they have a tremendous fear of dental treatment. People who have difficulty in brushing their teeth or maintaining oral hygiene by themselves. People who have difficulty in taking food by mouth or swallowing food safely. What considerations are given to the patients? Treatment is provided with an understanding of respective patients’ disabilities and based on a full and mutual understanding with parents/guardians and caregivers. For those who are intellectually challenged, the dental procedures are performed as the patients become more used to the treatment room, staff, instruments, and treatment. Sequencing picture cards or visual support cards may sometimes be used to inform the sequence of the treatment procedure. A cushion, etc. is used to hold the patient in the proper position during treatment, or safety measures are taken to prevent abrupt movement of the body. Using intravenous infusion, a tranquilizer, etc., treatment is performed while the patient is in a sleepy and relaxed state. General anesthesia allows the patient to receive intensive treatment without feeling pain. 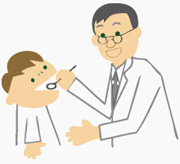 Tooth brushing guidance is provided using sequencing cards showing how to brush the teeth, and teeth cleaning of the parts that are difficult for the patient to brush and oral care are performed. Instruction and advice are provided about the posture and how to eat when taking a meal, as well as about textures of foods and beverages.